Presidents Day Weekend Deals! Get Up to $27 off service fees. Applies to bookings up to 3 travelers. A maximum of $9 per person can be saved by using this promo code; 3 passengers are needed to redeem the full value. Get up to $50 off Transaction Service fees. A maximum of $10 per person can be saved by using this promo code; 5 passengers are needed to redeem the full value. Get $50 statement credit when you open a OneTravel credit card account ($500 min spend). Get One way flights from $33.20 During Frontier Airlines Deals. There is a higher probability of seats being available at this fare on Tuesday, Wednesday, and Thursday, and may require a Saturday night stay at your destination. Lowest fares may require an advance purchase of up to 21 days. Certain blackout dates may apply. Other restrictions may apply. Travel by 03/06/2019 and Book by 12/26/2018. Weekend Flight Sale! Get One way flights from $23.30. There is a higher probability of seats being available at this fare on Tuesday, Wednesday, and Thursday, and may require a Saturday night stay at your destination. Lowest fares may require an advance purchase of up to 21 days. Certain blackout dates may apply. Other restrictions may apply. Travel by 03/06/2019 and Book by 01/13/2019. Get additional 5% Off international flights, get up to 30% total. savings. Fall Hotel Savings! Get up to 35% off Published Hotel Rates. Offer rates are subject to minimum length of stay requirements. Blackout dates, restricted arrival dates and any other terms and conditions may apply . January Flight Sale! Get One way flights from $26.80. There is a higher probability of seats being available at this fare on Tuesday, Wednesday, and Thursday, and may require a Saturday night stay at your destination. Lowest fares may require an advance purchase of up to 21 days. Certain blackout dates may apply. Other restrictions may apply. Travel by 01/31/2019 and Book by 01/07/2019. Year End Wrap Up Sale! 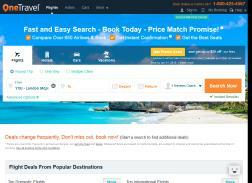 Get One way flights from $26.70. There is a higher probability of seats being available at this fare on Tuesday, Wednesday, and Thursday, and may require a Saturday night stay at your destination. Lowest fares may require an advance purchase of up to 21 days. Certain blackout dates may apply. Other restrictions may apply. Travel by 02/13/2019 and Book by 12/30/2018. Get up to $20 off airline ticket bookings. Book by 1/31/2019. Major Airlines Flight Sales! Get One Way Flights from $23.30. Lowest fares may require an advance purchase of up to 21 days. Certain blackout dates may apply. Other restrictions may apply.Travel by 03/06/2019. Book by 01/06/2019. Fare Shown: MIA – ATL, Departing: Feb 06, 2019. 24-Hr Flight Sale! Get One Way Fares from $24.30. Lowest fares may require an advance purchase of up to 21 days. Certain blackout dates may apply. Other restrictions may apply.Travel by 02/13/2019. Book by 01/02/2019. Fare Shown: ORF – TPA, Departing: 01/23/2019. Get up to $35 off Transaction Service Fees. A maximum of $7 per person can be saved. 5 passengers are needed to redeem the full value. Get 2 Bags Up to 55lbs Each Checked for Free + Free Rum Punch inflight on booking with Cayman Airways. Get Up to $20 Off Your Booking. Valid for up to 2 passengers on select flights. Offer valid for a limited time. New Year Flight Sale! Get One way flights from $19. There is a higher probability of seats being available at this fare on Tuesday, Wednesday, and Thursday, and may require a Saturday night stay at your destination. Lowest fares may require an advance purchase of up to 21 days. Certain blackout dates may apply. Other restrictions may apply. Travel by 02/25/2019 and Book by 12/31/2018. Massive Monday Flight Sale! Get One way flights from just $30.98. There is a higher probability of seats being available at this fare on Tuesday, Wednesday, and Thursday, and may require a Saturday night stay at your destination. Lowest fares may require an advance purchase of up to 21 days. Certain blackout dates may apply. Other restrictions may apply. Travel by 03/06/2019 and Book by 01/14/2019. Get Up to $20 Off Fees. Applies to bookings up to 2 travelers. A maximum of $10 per person can be saved by using this promo code; 2 passengers are needed to redeem the full value. Get up to $20 Off airline ticket Services when you sign up for emails. Applies to airline ticket bookings from one (1) traveler up to four (4) travelers. A maximum of $5 per person can be saved. offer expires on 01/31/2019. 24-Hr Flash Sale! Get One Way flight fares From $23.20. Book by: Dec 27, 2018, Travel by: Mar 13, 2019.